We create the perfect book packs for SATs & 11+ tests at discounted prices saving you time and money. Click and check out! Books for SATs KS1 & KS2 as well as 11+ tests from CEM and GL Assessment. Our prices are lower than Exam Ninja! Compare our low prices with the competition. Free UK delivery on orders valued at £30 and over or just £2.95, if below £30. Our special packs ensure KS1 and KS2 are covered, including mock KS1 and KS2 SATs papers. All personal orders receive a £10 discount code for 1 month unlimited access to www.CoolCleverKids.co.uk. This site contains over 17 years of past SATs Maths tests; as well as Spelling tests, and modified Science tests, all marked online (with explanations for Maths). 11+ Maths & NVR is also covered. Try it now by undertaking free tasks from the demo on the site. 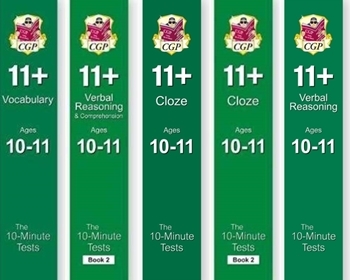 CoolCleverKids.co.uk is the most effective SATs & 11+ preparation tool. Early years pack from Reception to Year 2. 3 Books: Handwriting, Phonics and Times Tables. 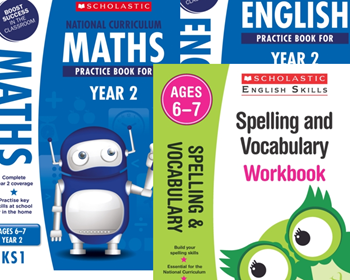 Scholastic Year 1 Learning Pack [5 BOOKS] KS1 SATs English and Maths Workbooks and Practice Books with FREE P&P. This pack contains 5 book for Year 1. Spelling and Vocabulary Workbook; Grammar and Punctuation Workbook; Comprehension Workbook; Maths Practice Book, and English Practice Book. 3 book pack of 10-minute test books covering Maths, Reading and Grammar, Punctuation and Spellings. Scholastic Year 2 KS2 Challenge Pack [3 BOOKS] Year 2 Extension Assessment Tests & Workbooks with FREE P&P. Scholastic Year 2 Exam Revision Pack [5 BOOKS] KS1 SATs revision guides and practice tests for English and Maths with FREE P&P. This pack contains 5 books. Year 2 KS1 SATs 3-Pack age 6-7 Scholastic complete English and Maths tests pack. This contains the same books as the Mock Test Pack. 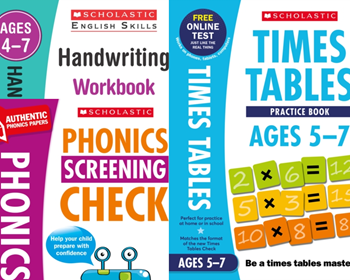 Scholastic Year 2 Mock Test Pack [3 BOOKS] KS1 SATs Practice tests for English and Maths. This pack contains 3 books. Year 2 KS1 SATs 3-Pack age 6-7 Scholastic complete English and Maths mock test pack. 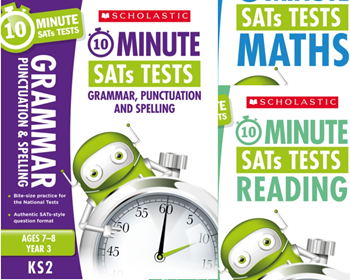 Scholastic Year 2 10 Minute Tests [3 BOOKS] KS1 SATs English, GPS and Maths. 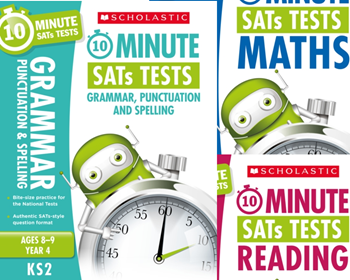 3 books: Scholastic 10-minute tests. 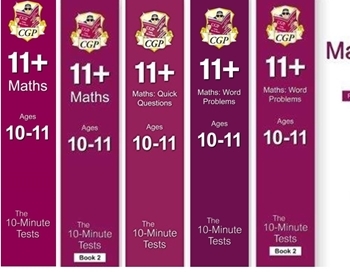 YEAR 2 10 MINUTE TESTS [3 BOOKS] KS2 SATS ENGLISH, GPS AND MATHS. Scholastic Year 3 Learning Pack [5 BOOKS] KS2 SATs textbooks and workbooks for English and Maths with FREE P&P. This pack contains 5 books. 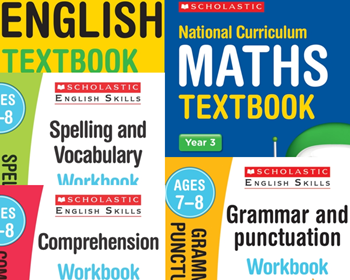 Year 3 SATs KS2 6-Pack Age 8-9 Learning for English & Maths by Scholastic . Scholastic Year 3 Exam Revision Pack [5 BOOKS] KS2 SATs revision guides and practice tests for English and Maths with FREE P&P. This pack contains 5 books. 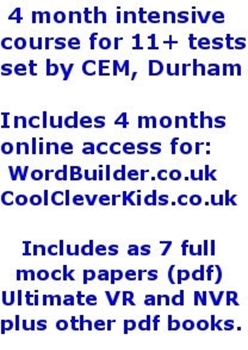 Year 3 KS2 SATs 5-Pack age 7-8 Scholastic complete English and Maths revision & tests pack. Free P&P. Scholastic Year 3 Mock Test Pack [3 BOOKS] KS2 SATs practice tests for English and Maths. This pack contains 3 books. Year 3 KS2 SATs 3-Pack age 7-8 Scholastic complete English and Maths tests pack. 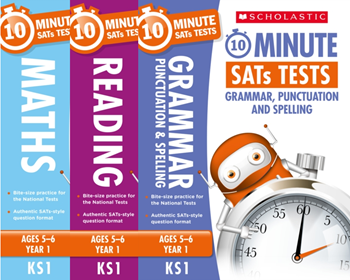 Scholastic Year 3 10 Minute Tests [3 BOOKS] KS2 SATs English, GPS and Maths. 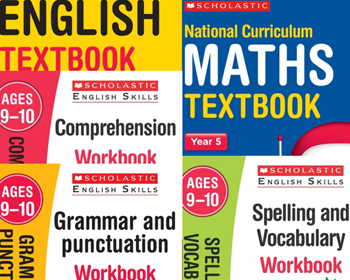 Scholastic Year 4 Learning Pack [5 BOOKS] KS2 SATs textbooks and workbooks for English and Maths with FREE P&P. This pack contains 5 books. 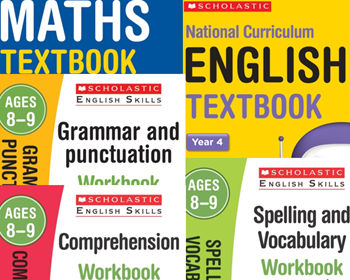 Year 4 SATs KS2 6-Pack Age 8-9 Learning for English & Maths from Scholastic . Scholastic Year 4 Exam Revision Pack [5 BOOKS] KS2 SATs revision books & practice tests for English and Maths with FREE P&P. 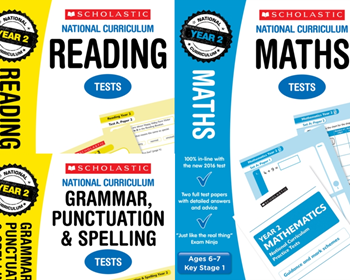 Scholastic Year 4 Mock Test Pack [3 BOOKS] KS2 SATs mock tests for English and Maths. This pack contains 3 books. 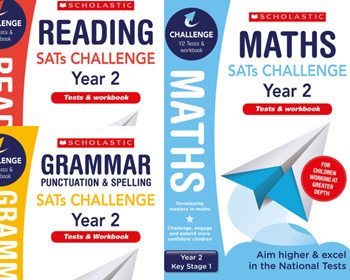 Year 4 KS2 SATs 3-Pack age 8-9 Scholastic complete English and Maths revision & tests pack from Scholastic . 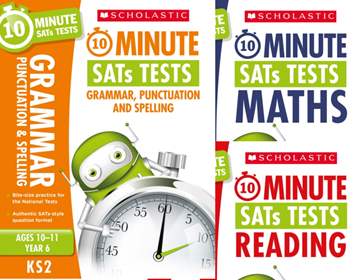 Scholastic Year 4 10 Minute Tests [3 BOOKS] KS2 SATs English, GPS and Maths. 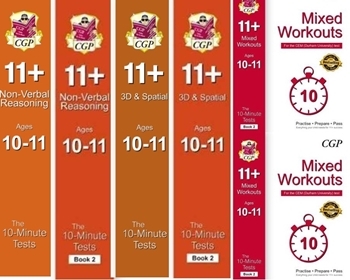 YEAR 4 10 MINUTE TESTS [3 BOOKS] KS1 SATS ENGLISH, GPS AND MATHS. Scholastic Year 5 Learning Pack [5 BOOKS] KS2 SATs textbooks & workbooks for English and Maths with FREE P&P. This pack contains 5 books. Year 5 SATs KS2 6-Pack Age 9-10 Learning for English & Maths from Scholastic. Scholastic Year 5 Exam Revision Pack [5 BOOKS] KS2 SATs revision guides and practice tests for Maths and English for FREE P&P. This pack contains 5 books. Year 5 KS2 SATs 5-Pack age 9-10 Scholastic complete English and Maths revision & tests pack. Free P&P. 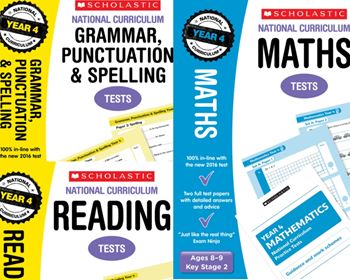 Scholastic Year 5 Mock Test Pack [3 BOOKS] KS2 SATs Tests for English, GPS and Maths.. This pack contains 3 books. Year 5 KS2 SATs 5-Pack age 9-10 Scholastic complete English and Maths revision & tests pack. 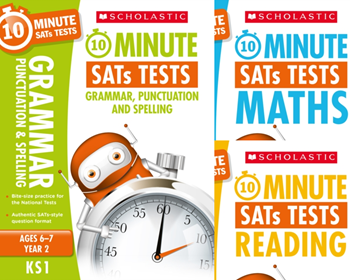 Scholastic Year 5 10 Minute Tests [3 BOOKS] KS1 SATs English, GPS and Maths. Scholastic YEAR 6 Learning Pack [5 BOOKS]. 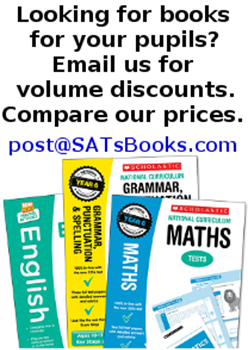 KS2 SATs workbooks and practice books for English and Maths with FREE P&P. This pack contains 5 books. 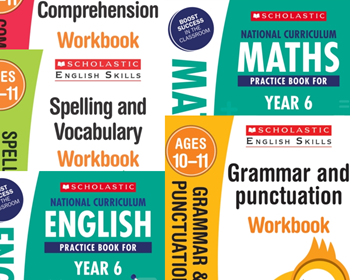 3 Workbooks and 2 Practice books Year 6 SATs KS2 5-Pack Learning for English and Maths from Scholastic. Scholastic Year 6 Exam Revision Pack [5 Books] KS2 SATs revision guides and practice tests for English and Maths with Free P&P. This pack contains 5 books. Scholastic test paper packs include answers and mark schemes. Recap a whole year of Maths and English schoolwork with revision guides, Structured revision matched to the curriculum The complete Scholastic pack for year 6 revision and practice. 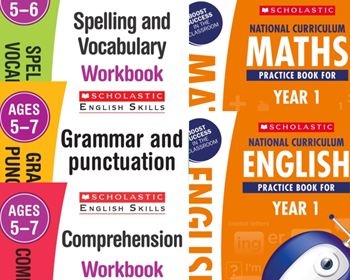 Scholastic Year 6 Mock Test Pack [3 BOOKS] KS2 SATs practice tests for English and Maths. This pack contains 3 books. Year 6 KS2 SATs 3-Pack age 10-11 Scholastic complete English and Maths tests pack. 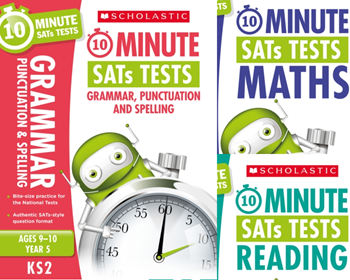 Scholastic Year 6 10 minute tests [3 BOOKS] KS2 SATs English, GPS and Maths. 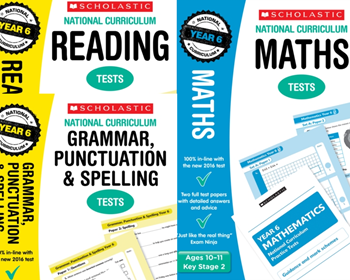 This pack contains 3 Books Year 6 Reading, Maths and GPS 10-minute tests from Scholastic . Just like the real thing - only shorter! 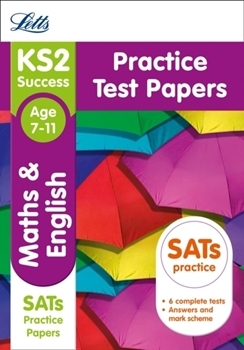 Help your child prepare for the SATs with these bite-sized National test papers. Scholastic Year 6 KS2 Challenge Pack [3 BOOKS] Year 6 Extension Assessment Tests & Workbooks with FREE P&P. Scholastic Year 6 Mock Test Pack with Science [4 BOOKS] KS2 SATs Practice tests for English, Maths and Science. This pack contains 4 books, including Science. 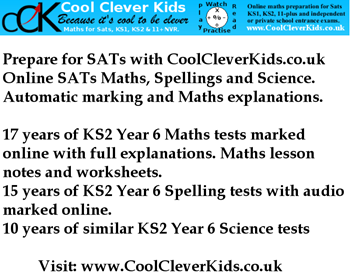 Year 6 KS2 SATs 5-Pack age 10-11 Scholastic complete English, Maths and Science tests pack. 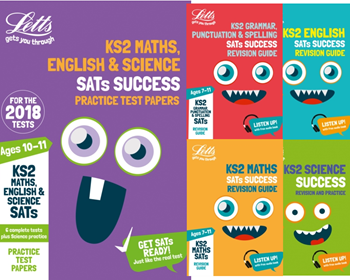 Letts Year 6 KS2 SATs Exam Revison Pack [5 BOOKS] for English, GPS, Maths & Science with FREE P&P. This pack contains 5 books consisting of a combined English, GPS, Maths and Science test book as well as separate revision guides for English, GPS, Maths and Science. Scholastic Year 6 to Reception books: Volume discounts for schools. Contact us. 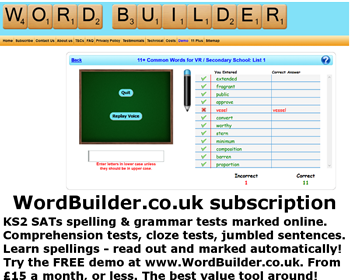 WordBuilder subscriptions for KS1 SATs and 11+. Visit www.WordBuilder.co.uk to subscribe. 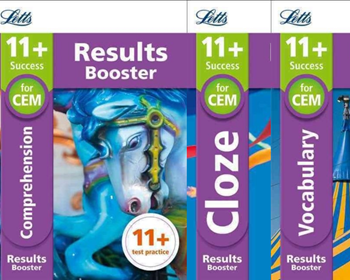 Letts CEM 11+ English Booster Pack [3 BOOKS] for Comprehension, Vocabulary and Cloze sentences. 3 Books. Letts CEM 11+ English Booster Pack [3 BOOKS] for Comprehension, Vocabulary and Cloze sentences. 3 Books to cover English/Verbal Reasoning. 5 Books. 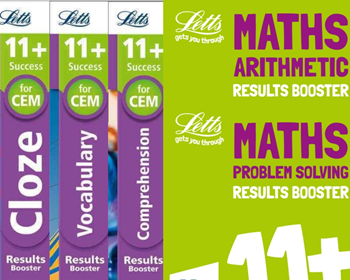 Letts CEM 11+ English & Maths Booster Pack [5 BOOKS] for Comprehension, Vocabulary, Cloze sentences, Maths Arithmetic and Maths Problem Solving. with FREE P&P. This contains 4 multiple choice quick test books for age 9-10 (year 4). 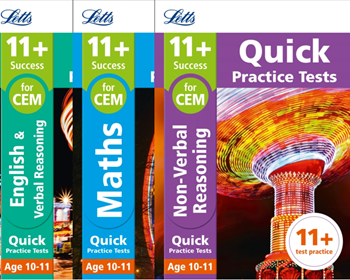 Letts GL Assessment 11+ Practice Test Pack [4 Books] covering English, Verbal Reasoning, Maths and Non-verbal Reasoning. 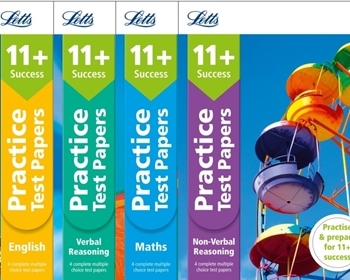 Letts GL Assessment 11+ Practice Test Pack 1 [4 Books] with FREE P&P. This contains 4 multiple choice test books. 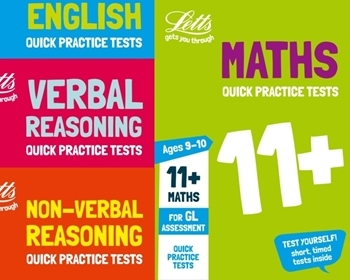 Letts GL Assessment 11+ Practice Test Pack [4 Books] covering English, Verbal Reasoning, Maths and Non-verbal Reasoning with FREE P&P. 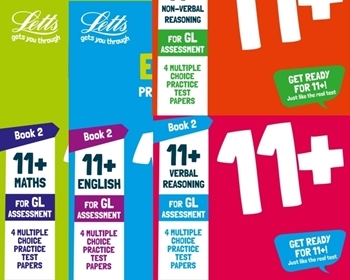 Letts GL Assessment 11+ Practice Test Pack 2 [4 Books] with FREE P&P. This contains 4 multiple choice test books. 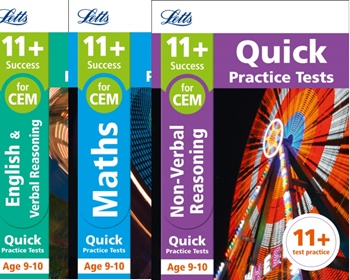 Letts GL Assessment 11+ Practice Test Pack 2 [4 Books] covering English, Verbal Reasoning, Maths and Non-verbal Reasoning with FREE P&P. Copyright © 2019 SatsBooks. All rights reserved.